Y’all, I am not going to lie. I requested this from NetGalley without even clicking to find out more info. The title and the cover were enough to draw me completely in. I didn’t know who Paul Rock was (the Senior Pastor of Second Presbyterian in Kansas City, MO), nor did I know that he had preached the contents of this book as a sermon series back in 2014. So I’ve got Pope Francis on the brain more than normal, but I’m also a religion scholar and a Protestant married to a Catholic who just moved from Northern Ireland where those two words mean more than just religious affiliation. So the premise of this book spoke to me. It’s a short one – clocking in at under 100 pages – and is written for use in a group discussion setting. The lessons are short and the questions provided at the end are good discussion questions. The whole thing is done from the perspective that I personally agree with – we have more in common than not, but the stuff we don’t scares us so much we don’t ever talk. We need to learn about each other so we can get our hands dirty together in service because that’s the Gospel. Divisions are fine to an extent because otherwise we’d be too big to belong, but hostile divisions are lame and usually born out of misunderstandings. The book focuses on Pope Francis (or Papa Frank as he is affectionately called in our house), and highlights how different he is from his predecessor, Pope Benedict. Where Benedict was closed off and super into upholding tradition, Francis is open and appears to be interested largely in upholding the Gospel as he sees it. There are absolutely things the author doesn’t agree with – the lack of ordination of women, the policy on excommunicating those who have had abortions or divorces, the attitude towards GLBTQ persons – but on the whole, there are points of dialogue and togetherness that Catholics and Protestants need to get together on. The book concludes with some helpful ideas for anyone who has gone through the study – and true to his Mainline ethos, a lot of them involve discussion and meeting others face-to-face. If you’re a Protestant and you’ve never been to Mass, find one and go. If you’re a Catholic who is scared of church, find a High Tradition congregation near you so it’ll feel a little familiar (Episcopalian/Anglican, some Presbyterian, etc) and go. Google around and see if there’s a religious professional in your area you can buy a cup of coffee for and ask questions. If you’re a reader, they provide a list of books to start with on understanding the parts of religion you don’t know. 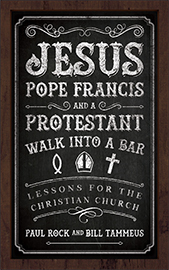 I would HIGHLY recommend this book for any of my pals in a Christian learning environment – church, book club, university, youth group, Sunday school, Catholic or Protestant. Read through it and see if it would work for your group. Accessible to high-school age and up, I think. It also works for personal reflection and is a quick read on ones own. I read it with a cup of tea and an open notebook and would recommend the same.